Samsung is ‘gearing’ up its lineup of accessories with new Gear IconX wireless earbuds and a new Gear Fit 2 fitness band, according to images leaked to VentureBeat’s. While the full specifications were not disclosed, some of the main features were revealed for the first time. The IconX is both a fitness tracker and a standalone music player with 4GB of onboard memory. They are also said to be dust and water resistant, and they come with a complementary charging case that houses the earbuds when not in use. Aside from being touch-controlled, the earbuds also works via Bluetooth. 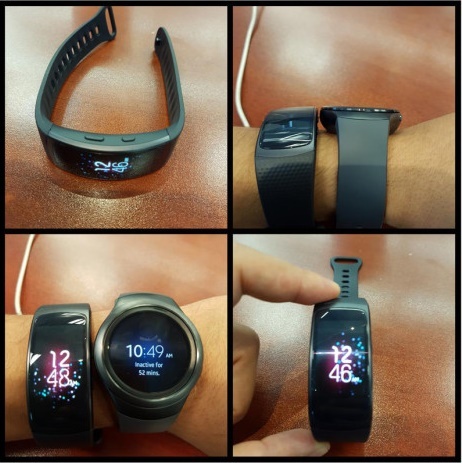 The next device in line is the Gear Fit 2, a followup to Samsung’s 2014 wearable – the Gear Fit. Like the original, this device will feature a 1.84-inch curved Super AMOLED display. It is also said to be more curved and ergonomic than the previous one. Report also notes that the Gear Fit 2 will sport a dedicated GPS chipset, something that was missing from the previous iteration. This will definitely help to improve the accuracy of its distance-tracking features. Pricing and launch date was not mentioned in the publication but it is likely that the Gear Fit 2 will be priced close to its predecessor. As always, it is best to take these leaks with a pinch of salt until we hear something official from Samsung.